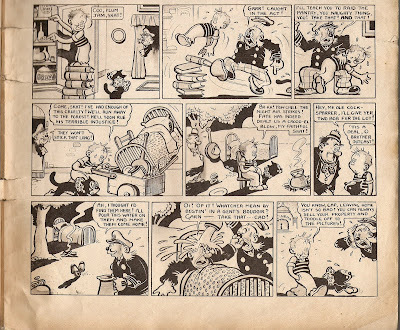 One of the few excursions of Basil Reynolds' 'Skit, Skat and Captain' out of Mickey Mouse Weekly, where it had debutted (see the earlier post in this blog), would be the four Mickey Mouse holiday specials put out by the weekly's publisher Odham Press between 1936-39. The above scan is from the last of these publications, titled Mickey Mouse Xmas Special. Besides 'Skit, Skat and Captain', Reynolds also contributed two Disneyic strips to this christmas special.